In a New York Times op-ed last week, New York Gov. 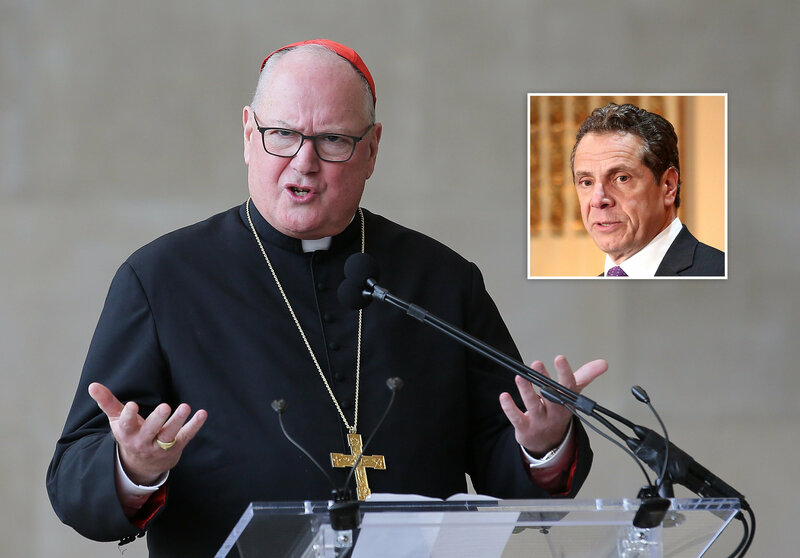 Andrew Cuomo (D) criticized the Catholic Church for its position on abortion, singling out Cardinal Timothy Dolen, the Archbishop of New York, and linking him with the "religious right." In his op-ed, Cuomo defended New York's "Reproductive Health Act" — a controversial law he signed last month that curtails most abortion restrictions in The Empire State — while pummeling President Donald Trump and conservatives for opposing the law. "Mr. Trump and the religious right are spreading falsehoods about New York's law to inflame their base. Activists on the far right continue to mislead with the ridiculous claim that the act will allow abortions up to a minute before birth," Cuomo wrote. While Cardinal Timothy Dolan, the archbishop of New York, and the Catholic Church are anti-choice, most Americans, including most Catholics, are pro-choice. The 73 percent of New Yorkers who support Roe includes 59 percent of Catholics. While governments may very well enact laws that are consistent with religious teaching, governments do not pass laws to be consistent with what any particular religion dictates. Later, Cuomo re-affirmed that he is Catholic — albeit, a pro-abortion member. "I was educated in religious schools, and I am a former altar boy," Cuomo wrote. "My Roman Catholic values are my personal values. The decisions I choose to make in my life, or in counseling my daughters, are based on my personal moral and religious beliefs." In a blog post on his personal website, Dolan responded to Cuomo's personal attack, charging that Cuomo is only now targeting the Catholic Church because it is politically expedient. "He did not consider me part of the 'religious right' when seeking my help with the minimum wage increase, prison reform, protection of migrant workers, a welcome of immigrants and refugees, and advocacy for college programs for the state's inmate population, which we were happy to partner with him on, because they were our causes too. I guess I was part of the 'religious left' in those cases," Dolan wrote. Dolan also criticized Cuomo for "hiding" behind politically charged words versus debating policy issues on merit. "Debate abortion on what it is. Don't hide behind labels like 'right wing' and 'Catholic,'" Dolan wrote. "Yes, religion is personal; it's hardly private, as the Reverend Dr. Martin Luther King, Jr.'s life and struggle for civil rights so eloquently showed. Governor Cuomo's professed faith teaches discrimination against immigrants is immoral, too. Does that mean he cannot let that moral principle guide his public policy? Clearly not," he added.